Is ionann sonóg nó fíor agus carachtar sainiúil agus suimiúil a úsáidtear mar uirlis margaíochta ar mhaithe le poiblíocht a dhéanamh ar fheachtas nó táirge. Cén tuairim atá againn ar Ghaeilge? - Ábhar scoile? Teanga beo? Cuid dár bhféiniúlacht? Cé a chuireann an Ghaeilge chun cinn? - Múinteoirí? Grúpaí sa phobal? Eagraíochtaí stáit? Cé hé nó cé hí an duine is fearr leis an nGaeilge a chur chun cinn sa phobal seo? - Uachtarán na hÉireann? Duine mór le rá ar na meáin shóisialta? Sárlaoch ar nós Black Panther? Inis scéal dóibh faoin nGaeilge sa cheantar. Céard iad na logainmneacha is suimiúla? An bhfuil aon bhéaloideas nó seanachas a bhaineann leis an gceantar? An bhfuil grúpa nó eagraíocht sa phobal a chuireann an Ghaeilge chun cinn? An féidir nasc a dhéanamh idir seo agus an sonóg? Breathnaigh tríd roinnt do na sonóga atá déanta ag dreamanna eile go háirithe ag foirne spóirt sa tSeapáin agus sna Stáit Aontaithe - áiteanna ina bhfuil siad an-tógtha le sonóga. Tá lán-fáilte roimh ábhar athchúrsálaithe a úsáid leis an sonóg ghaelach a chruthú. Bailigh roinnt bruscair le chéile agus lig do na daoine óga smaoineamh ar conas sonóg gaelach a dhéanamh as. Foghlaimeoirí a spreagadh le tuilleadh staidéir a dhéanamh ar an nGaeilge? Duine le cúpla focal a spreagadh le Gaeilge a úsáid lena gcairde nó ar na meáin shóisialta? Daoine atá líofacht na Gaeilge acu a spreagadh le himeachtaí as Gaeilge a eagrú sa cheantar? An duine a bheidh ann nó ainmhí nó rud? Smaoinigh ar tréithe fisiciúla - Is féidir le lámha móra cur in iúl gur carachtar láidir atá ann, is féidir le spéaclaí cur in iúl gur carachtar cliste atá ann srl. Smaoinigh go géar ar dathanna. An riail is tábhachtaí - coimead simplí é! Ar dtús cén sprioc atá ag an sonóg seo? Conas a bhfuil an sonóg seo chun seasamh amach? Cé hé/hí an carachtair seo? Conas a chuireann siad an Ghaeilge chun cinn? Cén fáth a bhfuil siad níos fearr ná aon sonóg eile? Má tá aon cheist eile agat ná bíodh imní ort teagmháil a dhéanamh linn ag pol@cnag.ie. A sonóg (mascot) or a figure is a unique and interesting character that is used as a marketing tool to promote a campaign or product. What is your opinion of Gaeilge? - School subject? Living language? Part of our identity? Who promotes Gaeilge? – Teachers? Community groups? State organisations? Who is the best person to promote Irish in this community? – the President of Ireland? A well known social media influencer? A superhero like Black Panther? Tell them a story about Gaeilge in the area. What are the most interesting place names? Is there folklore or old stories as Gaeilge to do with the area? Is there a group or organisation in the community that promotes Gaeilge? Can we make a link between this and the sonóg? Look through some of the mascots that have been made by other groups especially by sports teams in Japan and the US – places where they are very into mascots. We welcome the used of recycled materials when making the sonóg ghaelach. Gather some rubbish together and let the young people think about how to make a mascot from it. The most important rule – keep it simple! Firstly what is the exact aim of the sonóg? 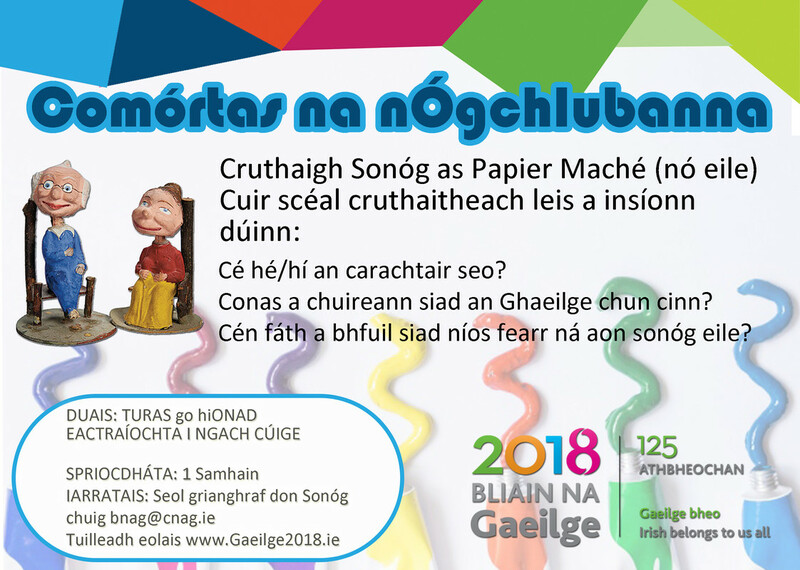 To encourage learners to study more Gaeilge? To encourage people with cúpla focal to use Gaeilge with their friends or on social media? To encourage people who have fluent Irish to organise events as Gaeilge in the area? How will this sonóg stand out? Will it be a person or an animal or a thing? Think about physical traits – big arms can portray a strong character, glasses can portray a clever character. How do they promote Gaeilge? What makes them better than any other sonóg? We will also accept applications send by post to Bliain na Gaeilge, Conradh na Gaeilge, 6 Harcourt Street, Dublin 2, D02 VH98.